Big Word Alert! Selenese – It is nothing but a set of selenium commands. A sequence of these commands forms a test script. Each line is a Selenium command which has three parts viz., Command, Target and Value. Some commands do not always require a Target and Value. Example, “close” command is used to close a window. Whereas “click” command requires a target and “type” command expects both target and value. Selenium commands come in three different flavors: Actions, Accessors and Assertions. These commands manipulate the state of the application by interacting with the web elements directly. If an Action fails or an error occurs, then the current test execution stops. The following commands in that test script will not be executed. type ( locator,value ) Sets the value of an input field, as though you typed it in. echo ( message ) Prints the specified message into the third table cell in your Selenese tables. Useful for debugging. focus ( locator ) Move the focus to the specified element; for example, if the element is an input field, move the cursor to that field. open ( url ) Opens an URL in the test frame. This accepts both relative and absolute URLs. setTimeout ( timeout ) Specifies the amount of time that Selenium will wait for actions to complete. Most of these actions are called with a suffix, “AndWait”, e.g. “clickAndWait”. This suffix makes sure that Selenium waits for the new page or element to load. These commands are used to examine the state of the application. These let us store the results in user defined variables which can be used for the purpose of assertions. They do not interact directly with the elements of the page. Example, “storeAllLinks” will read the IDs of all links on the page and store them in a user defined variable. If the result has multiple values, then the variable will be of array type. These are similar to accessors as they also do not interact directly with the web elements. Assertions are mainly used to verify if the application state confirms to what is expected. “assert” – When an “assert” fails, test execution is stopped immediately. Rest of the test script is not executed. “verify” – when a “verify” fails, Selenium IDE logs the failure in red color and the execution continues. “waitFor” – waits for a certain condition to become true before proceeding to the next command. By default, the timeout value is set to 30 seconds. This can be changed to the desired value. Upon failure, the test execution continues with the next steps. 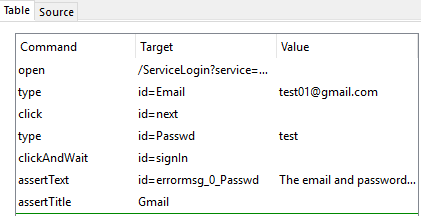 Failure is logged in Selenium IDE logs pane. More on “assert” and “verify” in upcoming blogs! Keep practicing different scenarios until then. A complete reference on these commands can be found in the official website, here.